Can you say that about your business and the products and services you offer? Or when you talk about what you do, does it sound the same as a bunch of other businesses in your field? These days, your ideal customers have a ton of options available to them. And as you work hard to make life better for them, you’ve got to stand out. You’ve got to make it an easy and obvious choice for them to choose you instead of all those other people who are doing similar things. And the best way to do that is to figure out how to build a business that is remarkable. When you do, you’ll find it a whole heck of a lot easier to win new customers and earn their loyalty. Something remarkable is worth talking about. Worth noticing. Exceptional. New. Interesting. It’s a Purple Cow. Boring stuff is invisible. It’s a brown cow. Remarkable marketing is the art of building things worth noticing right into your product or service. Not slapping on marketing as a last-minute add-on, but understanding that if your offering itself isn’t remarkable, it’s invisible. The goal here isn’t to go out and just do crazy, out of the ordinary things just to get attention. Rather, your objective is to bake uniqueness into the DNA of what you do as you serve your customers. And specifically, you’ve got to do it in a manner that your customers care about. A few weeks ago, I wandered into the Arte Tango shoe shop in my barrio in Buenos Aires. As I was chatting with the owner, I grew more and more interested in his shoes. Every time I asked a question, he explained a different feature that made his shoes different from all the other tango shoes on the market. I was so intrigued, I went back and did a quick interview with Ariel, the owner. Here he is explaining why his shoes are so remarkable. The remarkability of his product offering is built in by design. Custom-made tango shoes. With a flexible sole that isn’t typical of many tango shoes on the market. And with memory foam padding to make the shoes even more comfortable. When your uniqueness is intertwined into what you do, then it makes it easier for you to solve your customers’ problems like none other. It makes it easier for you to make your competition irrelevant. It makes it easier for you to live the good life while getting paid to change the world. But being remarkable isn’t just as simple as waking up one day and deciding that you’re going to be awesome (although that’s a great place to start). It’s a process. One that will require you to be intentional about developing the knowledge, expertise, and eye for creating something special. 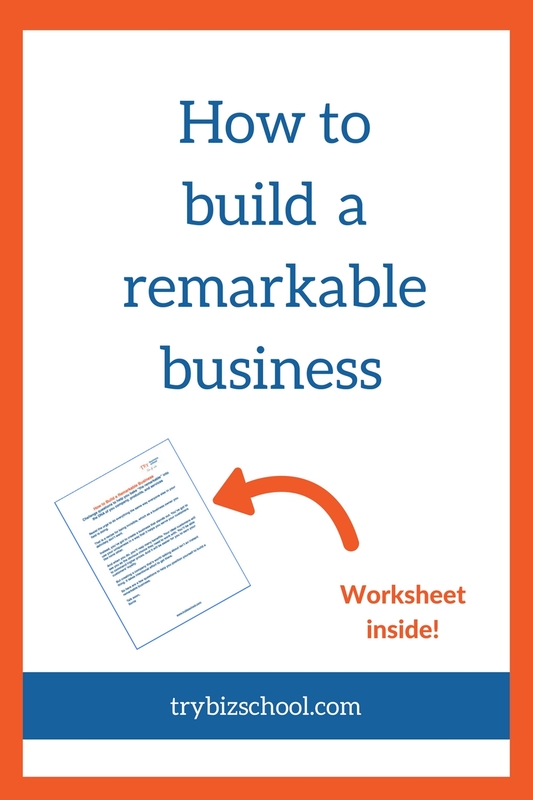 Here are 4 ways to position yourself to build a remarkable business. “If I were to use a map long enough, eventually I would become fearful of ditching it for a compass. However, if I want to do interesting work, take risks, and see what I am really made of, I have to be willing to use a compass instead of a map. The day I ditched the map for the compass is the day I walked off the edge of the Earth, and my work became an experience that only I can create for people. Every time I have been given a map, I have gotten lost. The map was based on where somebody else wanted me to end up. By following that map, at best I will become a pale imitation of the person who drew the map. This is one of the reasons why there is so much sameness in business. Everyone is following the same map. The same blueprint. The same ideas. And what happens when a bunch of people are on the same road? I don’t know anyone who likes traffic. This doesn’t mean that you ignore best practices and frameworks that have been proven to work in favor of feeling your way through everything. Rather, you should be extracting the important principles from them and then applying your own fingerprint to it to elevate it and make it something that works for you and your situation. I had a breakthrough in this area recently. Getting over this mindset barrier changed my entire outlook on what’s possible in my business and the things in which I’m able to accomplish. I’ve embraced this philosophy in life. That’s how I ended up here in Buenos Aires, and learning Spanish, and even dancing tango. And because of this openness to exploring and a willingness to see what is behind the door that is in front of me, I’ve found lots of new opportunities, surprises, and joy. When I allow myself to follow my compass in the direction life leads me, rather than forcing myself to follow my “pre-determined” plan, I’m able to innovate. To grow. To reject operating on autopilot. To not be a same old version of everyone else. And now I’m embracing this approach in my business. Then pick up your compass, and explore outside the lines. 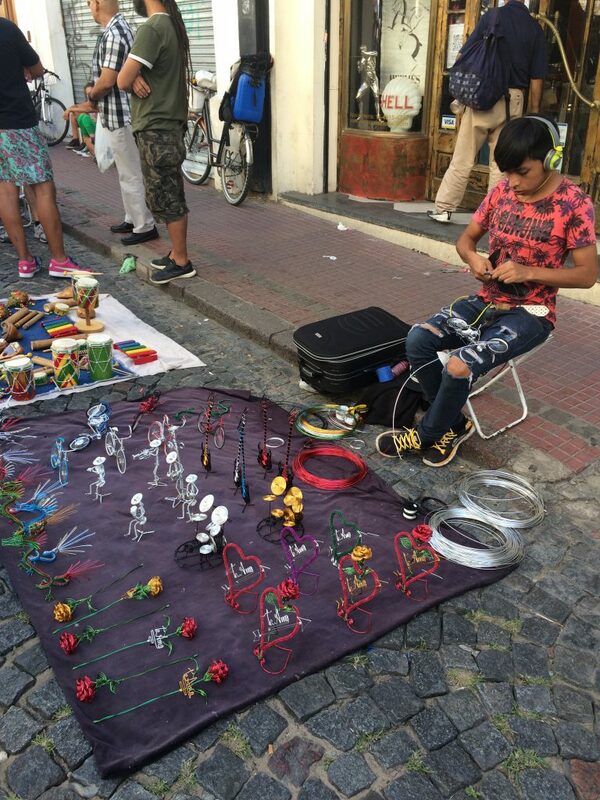 One of my favorite things to do here in Buenos Aires on Sunday’s is to go to the feria de San Telmo, a local street market. There are people who bake food in their homes and then bring them out to sell. 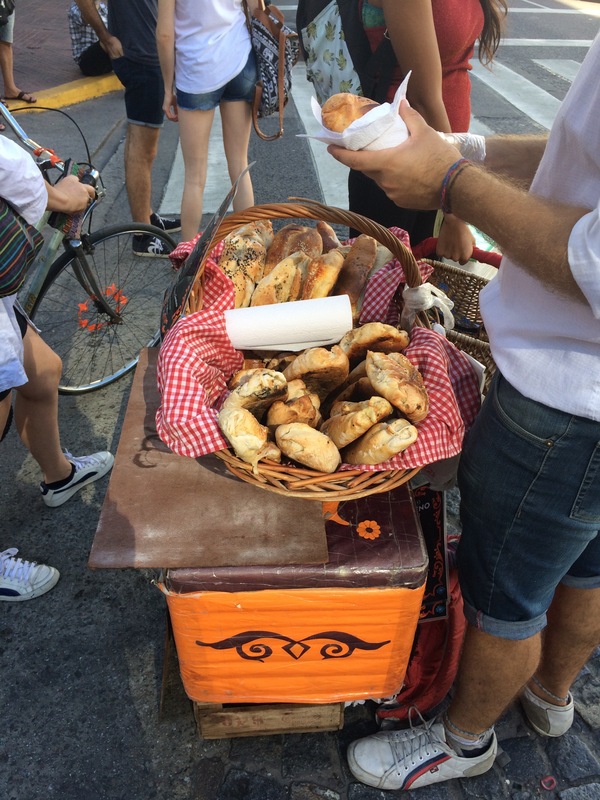 This guy had homemade stuffed bread. 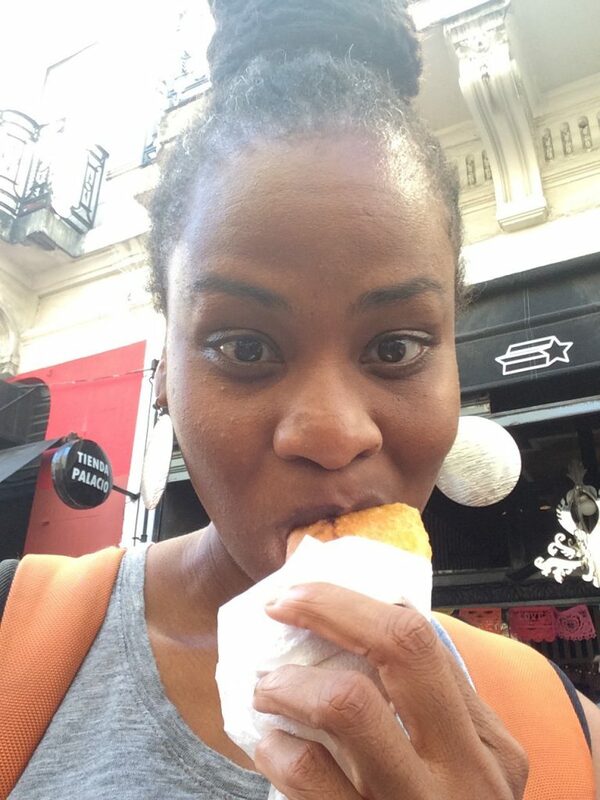 I even indulged in some homemade street food when I saw a girl selling Colombian-style empanadas. And there are musicians that come out and play their music. Everyone can find an audience. And the experience of coming and finding a space and just putting themselves out there is what strikes me as most fascinating. This is where fearlessness and boldness are developed. This is the essence of entrepreneurship. A lot of times as business owners, we only want the big, high profile opportunities. But it’s in embracing the experiences and skill development you gain from doing your work in a more indie, grassroots, level, that prepares you for the big time. It’s what gives you the experiences you need to find out what works and doesn’t work for you. To assess what your ideal customers respond best to. To figure out your strengths and important areas that need improvement. Bruno Mars (who I adore!) followed this path. Today he is an amazing, remarkable performer, that wows audiences in packed stadiums all over the world. But he developed into the performer that he is by investing time in more humble beginnings early on. Remember Ariel, the tango shoe designer from earlier? He started making tango shoes when he was 16 and has been doing it for nearly 25 years. He didn’t always have a remarkable, patented shoe. But through the process of doing the work, in public, over and over again, like Bruno Mars, he was able to create something worth paying attention to in his field. One of the reasons why so many businesses get stuck in the sea of sameness is because they are too busy following the same people, the same examples, and running in the same circles as everyone else. Even when they aren’t following the same roadmap. To do and create remarkable things, you’ve got to seek out different experiences and different points of view. Steve Jobs was an advocate of this. If you’re gonna make connections which are innovative, you have to not have the same bag of experience as everyone else does. Research proves this out as well. One study showed that fashion designers were more creative when they spent time living abroad in places that were significantly different from where they were from where they lived. The time in new foreign environments forced their minds to problem-solve and view everyday occurrences with different lenses. Inspiration can come from everywhere. Look at other industries. Look at non-business related things. Make connections from things that seem like they are unrelated, and then figure out how you can use it to your advantage to create something remarkable. In the 1960’s, Motown was one of the most successful record labels, with iconic groups such as The Jackson 5, The Temptations, and The Supremes signed to it. Founder Barry Gordy and his team produced hit after hit. “He loosely modeled the Motown operation on the most prosperous business model he saw around him – the assembly lines at the many automotive plants in the region. (In fact, Gordy himself had worked in a Ford assembly plant during the 1950s.) Instead of assembling cars, though, he put together hit records. All of these entrepreneurs asked this defining question. And going down the rabbit hole to answer how to do it led them to building multi-million dollar businesses. This defining question can change everything for you. Instead of marching down the path of doing what has already been done with just a few minor tweaks, it helps you go down the path of creating something that demolishes the status quo in a big way. But before you can make asking this question work for you and your business, you’ve got to believe that you are capable of making what you dream about a reality. You can’t let your present circumstances, abilities, or current frame of reference deter you. “Firstly you need to aim beyond what you are capable of. You must develop a complete disregard for where your abilities end. Try to do the things that you’re incapable of. If you think you’re unable to work for the best company in its sphere, make that your aim. If you think you’re incapable of running a company, make that your aim. If you think you’re unable to be on the cover of Time magazine, make it your business to be there. Make your vision of where you want to be a reality. You make your competition irrelevant. Your ideal customers choose you and are eager to work with you. You can charge premium prices for your expertise. And you make life better for your customers. It’s a win-win-win all around. But as with most things that are worth it, it isn’t easy. It takes time. It takes courage. And it takes a commitment to going down the alternate path, even when you’re not sure where you’ll come out on the other side. But you can do it. I know that you can! It’s time for you to put your unique fingerprint on the work that you do. So evict the notion of being an invisible brown cow. And let’s get to work on building something worth talking about. Purple cowabunga! Rise above the din. In the natural world, the Queen Bee flies high & only the strongest drone can reach her. I’m reminded of this in business. Get this good & my competition would become customers. Oh, the map & compass metaphors ‘encompass’ ideas that occurred to me when I used to go out to sea on commercial vessels in Alaska. From the first mariners to the captains of merchant & cruise ships. They can’t see their destination from their point of origin but they know where they’re headed, how to get there & deal with possible complications along the way. Someone said, “You can’t control the wind but you can adjust your sails”. My, my, mindset! (m9ds8). One of my challenges is increasing my “believe, achieve, receive” mindset & barriers. Motown: I heard most of the early artist lived in the same neighborhood & Smokey Robinson was one of the original 6 employees. Amazing. Like a mighty oak tree born from a tiny acorn. And Paul Arden just blasted me off the planet. I had to look the boy up & download his book. Chuck Norris grew up a tiny kid who got bullied. He set out to ‘remedy’ that. He said, “It’s not how good you are. It’s how bad you want it”. Dug! When I first learned about that Motown/Barry Gordy story I was so intrigued – glad you dug it too. And that Paul Arden book was awesome – super short, but like a shot of espresso. Loved it – I’m sure you’ll enjoy it.